The main objectives of the scientific research carried out in the Department of Molecular Compounds Physics are addressed to a better understanding of the photo-induced electronic processes and structure-function relationship of various organic and hybrid systems seeking control possibilities for optimisation of optoelectronic devices. For these purposes various ultrafast spectroscopy methods are widely used for experimental studies of excitation dynamics by identifying optical and electrical properties of molecular materials and determining functioning principles and operational abilities of molecular devices. For better understanding, the details of the photo-induced generation of charge carriers the time-resolved measurements of the Stark effect and the second harmonic generation technique in combination with the conventional time-of-flight method are developed and used. Studies of the processes in biological objects are attributed to another research direction carried out in the department. For studies of the primary processes of photosynthesis ultrafast spectroscopy methods together with modelling capabilities are used. Theoretical approach by describing the excitation dynamics and transfer of charges (electrons, protons) with emphasis to the possible role of the protein scaffold is extensively used. 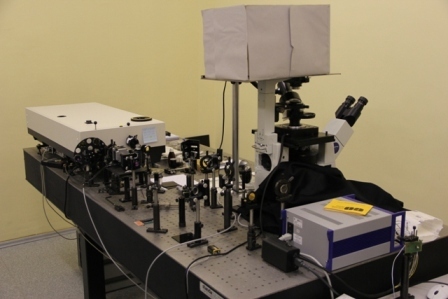 In addition to that CARS and multiphoton fluorescence microscopy developed in the department provides a way to determine invisible details of biological objects and other molecular structures with sub-micrometer spatial resolution. For more detailed mechanistic and structural studies of biomolecules and biomolecular interaction, two-dimenitonal electronic spectroscopy, time-resolved fluorescence measurements and home-build single-molecule fluorescence microscope with a spectrometer are used. 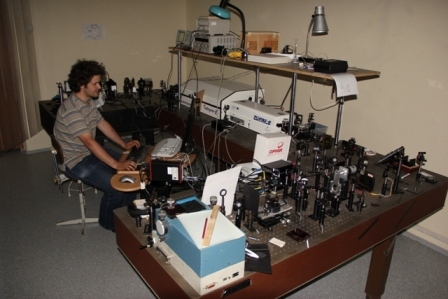 The Department of Molecular Compounds Physics consists of two laboratories: Ultrafast Spectroscopy Laboratory and Biophysical Research Laboratory. The FLS920-t is a modular, computer controlled fluorescence lifetime spectrometer. Based on an L – geometry hardware configuration, the FLS920-t utilizes the technique of Time Correlated Single Photon Counting (TCSPC) to measure time resolved luminescence spectra and luminescence lifetimes spanning the range from 100 picoseconds to 10 microseconds, with the accuracy and the resolution that only the technique of TCSPC can offer. 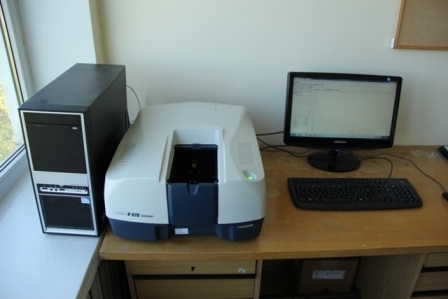 Spectrometer is directly connect to computer for data acquisition and analysis (deconvolution). Streak camera is a device used to measure ultra-fast fluorescence. Several of the many advantages against other fluorescence measuring systems is that streak camera can register the entire data-set in very short time and it has very high time resolution – up to 0,2 ps. The principle of operation of the camera is similar to analog oscilloscope. Inside the device light is converted into stream of electrons, which is then converted back to light. The main concept of the camera is to bend the trajectory of the electrons with a varying electric field, which increases over time. Thus, the last electrons which arrive at the camera get bent the most. Since only one coordinate of the camera is used for time resolution (electron trajectory deviation), the other coordinate can be used to get spectral information. This allows gathering all the spectra with extremely good time resolution in one sweep. Streak camera is extremely useful if the sample is degrading fast or if we need to measure only the start of fluorescence decay (50-200 ps). Our system uses 3W 1030nm "Pharos" as the main oscilator and "Hiro" harmonics genereator to produce laser pulses of ~80ps and 1030nm, 515nm, 343nm or 257nm. Frequency of the main oscilator (76MHz) can be reduced to 10kHz using Pockels cell. The set-up is currently under construction. More info soon. Pump-probe technique is probably the most widely used variation of ultrafast spectroscopy technique. Its concept is very simple and uses two short laser pulses: an intense pulse, ‘the pump’, which induces a photoreaction in the studied system and a weaker pulse, ‘the probe’, which monitors the corresponding change in the absorption spectrum of the sample. The delay of the probe pulse can be varied with respect to that of the pump and thus, the corresponding absorption change in the samples can be recorded at different time instances after the arrival of the pump pulse. Absorption change dynamics shows various processes that happen during the relaxation of photoexcited molecules. 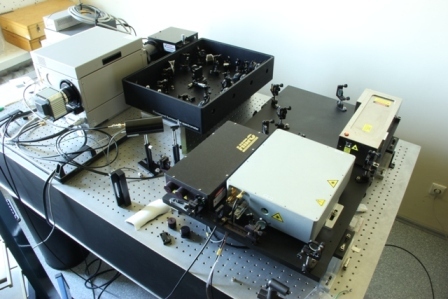 The spectrometer is based on an amplified femtosecond Ti: sapphire laser Quantronix Integra-C generating 130 fs duration pulses at 805 nm at a 1 kHz repetition rate. Optical parametric generator TOPAS-C is used for tuning of pump pulses wavelength. We use a 2 mm thick sapphire or calcium fluoride plate in order to generate a white light continuum for probing differential absorption. CARS microscopy is label free technique which contrast mechanism based on intrinsic molecule vibrations enabling chemical selective imaging. CARS is orders of magnitude more sensitive than spontaneous Raman. Nonlinear nature of CARS signal provides 3D imaging possibility without using confocal microscopy configuration. The Anti-stokes signal is blue-shifted and therefore is free from one-photon fluorescence background. 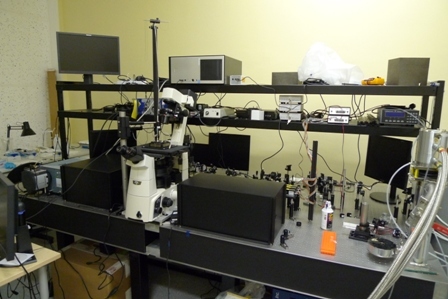 Our home-made CARS microscope setup includes a dual wavelength laser source and a scanning microscope. 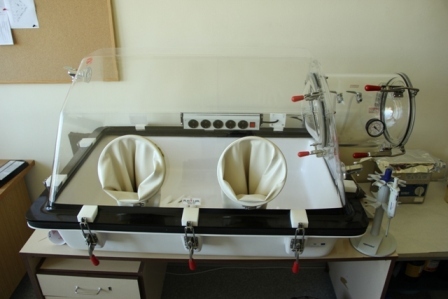 The laser consists of a picosecond frequency doubled Nd:YVO4 pump laser with the pulse repetition rate of 1 MHz equipped with a traveling wave optical parametric generator (OPG) which enables probing the 700 – 4500 cm-1 range of vibration frequencies. In our scheme for CARS implementation a signal radiation from the OPG (6 ps) is coupled with fundamental wavelength (1064 nm) and used as Pump and Stokes excitation beams, respectively. By exciting a wide sample field in total internal reflection (TIR) mode and detecting fluorescence signal from a number of individual molecules in parallel. Fluorescence image is split into two spectral components. The temporal resolution is limited, however, to approximately a video rate. The main advantage of this detection mode – the possibility of observation of a large number of molecules in parallel. It also allows us to monitor single-molecule FRET signals . By exciting individual molecules in confocal mode and monitoring fluorescence from separate molecules one at a time. In this mode, it is possible to acquire full fluorescence spectra and achieve better temporal resolution. Temporal resolution for spectral acquisition is a few milliseconds, whereas if opting for the detection of only two spectral components, temporal resolution is up to a few tens of nanoseconds. Moreover, in the confocal mode, it is possible to collect fluorescence bursts from molecules diffusing freely in solution. This way vast data statistics are collected relatively fast. By analysing such data with correlation analysis, it is possible to determine, for example, the efficiency of the excitation energy transfer inside the molecule of interest. Recently our setup was upgraded with an alternated laser excitation (ALEX)  and a beam rotation in the back focal plane of the objective, which allows us to achieve more even wide field illumination. The analysis package is written in “Igor Pro” language. This software can only be distributed upon direct request to the author! 2D histogram plotting of the analysis results. It can handle most of the single-molecule data formats. The software has internal memory for entered parameters, the size of windows and their positions. Each part of the program gives output as tables of igor binary format. There is an additional function in the main panel to convert them into delimited text format. Software development was under MacOS, therefore, it may happen that Windows users find some small problems. The best performing current state-of- the- art organic solar cells use fullerene-based electron acceptor mate rials. Attempts to use other, cheaper acceptor mate rials are less successful, and still remains not clear why. Recent investigations including our works revealed a relatively high electron mobility in fullerene materials, which is believed to be of the major importance for carrier generation and ,extract ion. Generally, charge carrier mobility and diffusion coefficient are among the most important parameters of electronic materials . In organic materials these parameters are typically much lower than in inorganic semiconductor.s., however strongly time-dependent; initially may be several orders of magnitude higher . In this project we will foe-us on the carrier generation and mobility dynamics in solar cells with acceptor materials based on polymers and small molecules with high electron affinity or semiconductor nanoparticles. The project aims at the development of the conceptional picture how the carrier generation and extract ion is related to the properties of electron accepting materials. We will apply photoelectrical and optical methods with ultrahigh time resolution, as well as advanced theoretical techniques to address the carrier generation mechanism and dynamics. The final task of the project is to formulate the requirements for the electron accepting materials enabling efficient operation of organic solar cells. High efficiency of metoloorganic perovskite solar cells achieved to date suggests that these materials may be successfully applied for light detectors as well. Owing to exceptional properties of perovskites and their fabrication technologies these detectors are expected to reach parameters comparable with those based on inorganic semiconductors and to have some unique properties, such as low price, large area, flexibility, compatibility with state of the art organic electronics circuits. Operation principles of solar cells and detectors are similar by many aspects, but there are several essential differences, which require different materials and device structures. There are several possible different architectures of perovskite-based photo detectors which may enable optimization of different parameters important for various applications .. 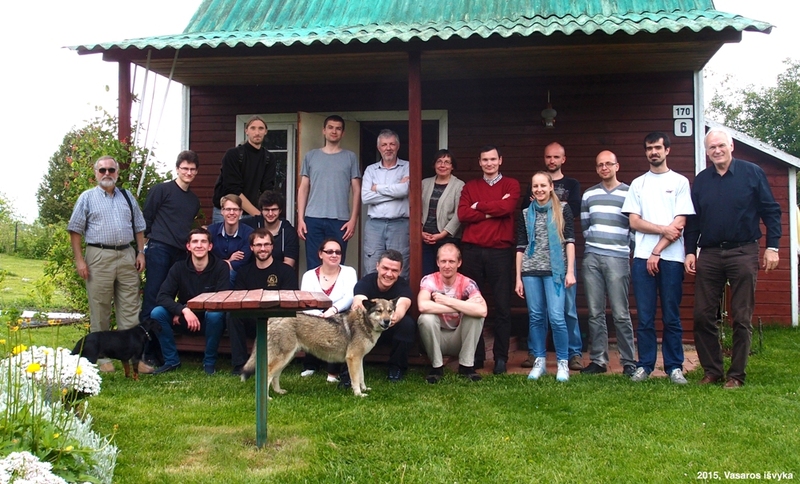 The aim of this project is to investigate the applicability of CH3NH3PbX3 perovskites for light detectors, evaluation of viability of different device architectures and eventually, creation of a photodetector, which by some parameters could be be comparable or superior to commercially available conventional semiconductor detectors. During this project , we will gain expertise in new technologies of fabrication of metaloorganic perovskites and fabrication of their films, develop new charge transport materials, develop and adapt spectroscopic methods for investigation of perovskites and their devices. Consequently, the project will enable the gain of competence in a very modern and innovative area of new generation optical electronics and creation of infrastructure necessary for its further development. 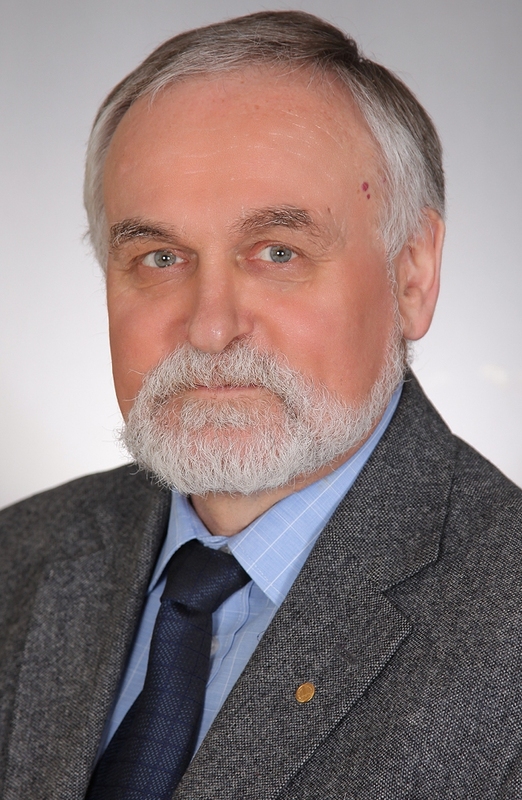 “Analysis of Photophysical Processes of Novel Light-emitting Aromatic Polymers Based on Fast Time-resolved Spectroscopy”, Lithuanian-Japan science project. Research Council of Lithuania. 2017-2019. The project aims at development of photonic materials based on phthalimide compounds and polyimides.. Polyimides, due to their rigid structures and strong intermolecular interactions, are thermally and chemically stable materials with interesting thermal, mechanical, and optical properties. Moreover, their properties may be significantly varied by changing their chemical structures . It makes polyimides very interesting for creation of photonic materials for photovoltaic devices, organic light emitting diodes, functional liquid crystal alignment films, and solar spectrum converter. Luminescence properties of polyimides (quantum yield. spectrum ) may be varied by creating conditions for the excited sate internal proton transfer , aggregation, and interconversion transitions to triplet states. These processes take place simultaneously, interact and complete. 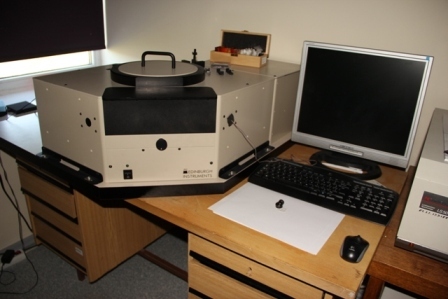 Spectroscopic methods , particularly time resolved, are the major tool to get information about the electronic properties about materials and light induced processes necessary for development of advanced materials. We will investigate novel polyimides with different chemical structures with attached I, Br, and F atoms, which increase the internal conversion rate and influence the internal proton transfer. Ultrafast luminescence and transient absorption techniques :1i0 0 - e information about the rates of competing processes . Their dependences on the chemical structure, material morphology, temperature, a reveal their influence on the luminescence yields and spectra and possibilities to control them.